STELLA &amp; DOT | NEW SUMMER COLLECTION! | 2019! Amazon Price: $89.99 (as of October 17, 2017 10:04 pm - Details). Product prices and availability are accurate as of the date/time indicated and are subject to change. Any price and availability information displayed on the Amazon site at the time of purchase will apply to the purchase of this product. Local artisan Sheila from the Philippine Islands showcases amazing craftsmanship with this handmade necklace. 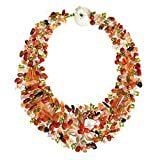 The necklace features native mother of pearl (dyed), reconstructed red coral, carnelian, tiger's eye and beading in a truly exotic tropical motif. Chic yet casual, this breathtaking necklace is great for making a fashion statement. PLEASE NOTE: The handcrafted nature of this product will produce minor differences in design, sizing and weight. Variations will occur from piece to piece, measurements may vary slightly. ARTISAN STORY: Evoynne and Sheila are two young and charismatic sisters who love Cebu Island, Philippines where they are from. Evoynne and Sheila began designing and producing handmade jewelry that focused on using native and beachy material such as unique shells, pearls, wood, beads and coral scattered across the sands. Evoynne and Sheila truly enjoy creating beautiful, unique, and native jewelry.